Lofthouse Sugar cookies are those soft-cake like lofthouse sugar cookies you find at the grocery store frosted with a sweet buttercream. This is a homemade recipe for the cookies and delicious icing. I could not resist trying these cookies when I saw them described as tasting exactly like the delicious LoftHouse Sugar Cookies sold in grocery store bakeries. hey are soft, moist, very addictive and fluffy (a bit fluffier than the store bought kind, in my opinion). Well, the verdict is, they DID taste very similar and I really can’t wait to share them with everyone on Christmas for our holiday dessert. 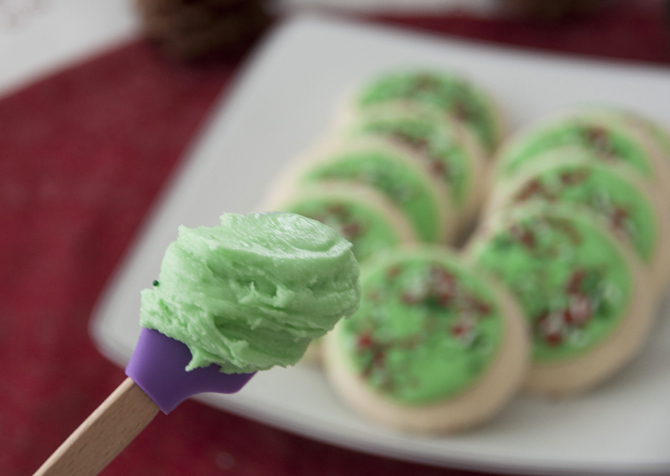 What a perfect, easy Christmas cookie! I thought these lofthouse sugar cookies were quite tasty, but I know that they may not appeal to everyone, since they do taste a bit different than the lofthouse sugar cookies in the store. They are pretty darn close to the taste for a homemade version and they taste great either way, right?! 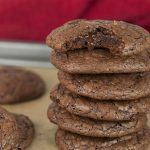 You really can’t go wrong with these cookies and everyone is sure to love them. I think these were the first cookies to be finished off my of my holiday baking trays. Note: the dough for these sugar cookies is VERY soft to work with, so just be prepared. It’s good to keep the dough you aren’t rolling out at the moment in the refrigerator while you work with the rest of the dough. 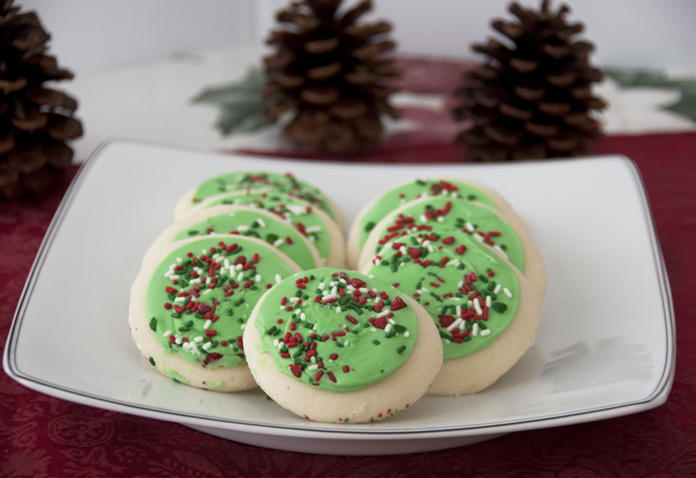 Store cookies in an airtight container if there are any leftover so they stay soft! Also, keep in mind that the texture of these Lofthouse sugar cookies are more fluffy and cakey than your typical sugar cookie you are used to. Enjoy these cookies, happy baking, and have a very Merry Christmas! Don’t you just want to eat that frosting with a spoon? Lofthouse Sugar cookies are those soft-cake like sugar cookies you find at the grocery store frosted with a sweet buttercream. This is a homemade recipe for the cookies and delicious icing. In the bowl of a stand mixer with the paddle/flat beater attached, cream the butter and granulated sugar at medium speed until light and fluffy, about 3 minutes. Add the eggs, ONE at a time – beating until each is well incorporated. 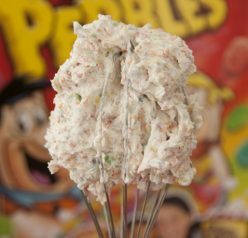 Add the dry ingredients and beat at low speed until just combined, scraping down the bowl as needed. Dough will be a bit “sticky”. Divide dough into two sections. Flatten into rectangles about 1½ inches thick, then wrap with plastic wrap. Chill in the refrigerator overnight or several hours, until firm (make sure it feels firm before you work with it or it still stick to everything). Preheat the oven to 425 degrees. Line 2 large baking sheets with parchment paper/silicone baking mat or spray them with nonstick cooking spray, set aside. Use the plastic wrap that you chilled the dough in. Dust the top of the dough and then flip and generously flour the other side, keeping it ON the plastic wrap. Use flour generously to keep from sticking! Using a 2½-inch round cookie cutter, cut out circles and transfer to a baking sheet. Bake for 7 minutes, until pale golden. Immediately transfer cookies to a wire rack to cool. It is best to work in small batches while keeping the remainder of the dough chilled since this dough is so soft. To make the frosting, in the bowl of a stand mixer fitted with the paddle attachment, cream together the butter and vanilla. Once smooth and creamy, add in heavy cream, 1 tablespoon at a time, then beat at medium-high speed for a minute or two until light and fluffy. If desired, add food coloring and beat until combined. Once cookies have cooled completely, frost and add sprinkles. 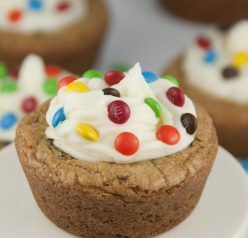 Allow frosting to set, then store in an air-tight container. Let cookies sit for several hours before serving to allow the flavors to develop. The frosting is so good! Lofthouse sugar cookies are one of the best things EVER! I love that you recreated them :). I saw these in the store and wondered how it would be to make them at home. Now I don’t have to figure it out! Yay! You did a great job with these! They are pretty simple to make at home! Thanks Nancy, and merry Christmas! Don’t I want to eat that frosting with a spoon? Yes, I do! Looks delicious! Love how soft these look. Have a great holiday girl! I definitely had a few spoonfuls of the frosting ! They r a little bit of work but so worth it! 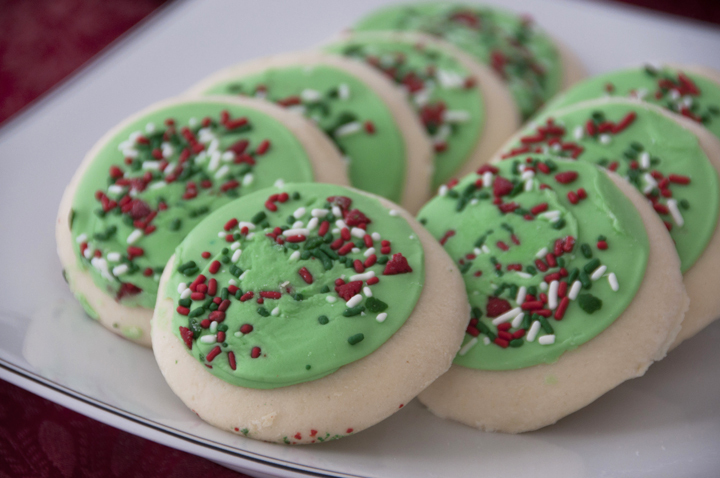 These are some of my favorite cookies! Yours look wonderful. Merry Christmas! They have crack in them haha you’re probably right! I did have a few spoonfuls, I have to say! Thanks Charlie! So not sure what I did wrong. But these weren’t the same as the store bought cookies. They were airy and fluffy ???? Hi, I just tried making these cookies, & they turned out so well! Im in love with these cookies now! I loved the one’s at the bakery, but these are amazing, & so much fun to decorate!!!??????????? ?